The NHS always has been a totemic issue for Labour and, in recent decades, has often been seen as a key election issue. But this time there seems even more determination by Labour to make the state of the NHS the defining issue of the campaign. The stresses and strains on the service this winter have given a new edge to arguments over the financing and future shape of healthcare. And now we have Labour's detailed plan - so how does it stack up? Up to a point, today's speeches by the Labour leader Ed Miliband and shadow health secretary Andy Burnham re-state what was set out at the party conference. There's the pledge to raise an extra £2.5bn a year for the NHS in England, funded by a mansion tax, a levy on tobacco companies and closing a financial services tax loophole. The money will be spent on thousands more health staff. But the radical strand of thinking running through Labour's plans is a long-term aim to integrate health and social care and we have learned more about how they hope to achieve this. "Joining up care from home to hospital," is the party's mantra and it is in tune with the policy aspirations of many health experts and think tanks. The unprecedented pressures on hospitals this winter have re-focused attention on the difficulties of moving elderly patients back into the community. Beds occupied by people subject to "delayed discharge" are increasing with the blame placed on problems ensuring there is adequate social care at home. While spending on the NHS in England has increased under this government, that has not been the case so far for social care. Expenditure fell 3% in real terms over the five years to 2013-14. Labour's answer includes the recruitment of 5,000 homecare workers - NHS staff who will be employed visiting and caring for patients in the community. They will be part of the recruitment drive paid for by the £2.5bn of new money. Labour argues that these new staff could help save money by keeping more people out of hospital. Another specific policy is for GP checks on vulnerable elderly patients. Armed with new software, practices will be able to comb their database to identify those thought to be most in need of help. There will be safety checks in the homes of these patients and moves to ensure they are not isolated or cold. 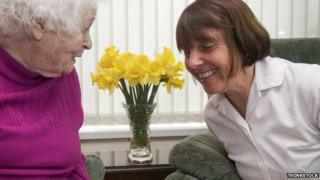 Labour is also focusing on ending the "15-minute culture" which sees hard-pressed and sometimes underpaid social care workers unable to do enough for elderly people on their home visits. The aim is to raise standards in the outsourced care sector and penalise organisations whose elderly charges need extensive hospital care. What's lacking is a detailed explanation of how NHS money and local authority social care budgets would be pooled. There are complex organisational challenges in all this which are not addressed. Labour has promised more money for the NHS, but has no similar pledge for social services funding. A senior party source told me there will be a commitment to "prioritise" social care budgets to ensure there is no repeat of the cuts in this parliament - but this is not the same as a costed pledge. The rhetoric and policy ideas set out by Mr Miliband and Mr Burnham will find few critics. But more detail on this vital election issue will be sought out as polling day gets nearer.